Is it too early for a Christmas post? I don’t think so! I start sending my Christmas presents at the beginning of November because the postal service of both Mexico and Colombia is abysmal and my presents never arrive on time. 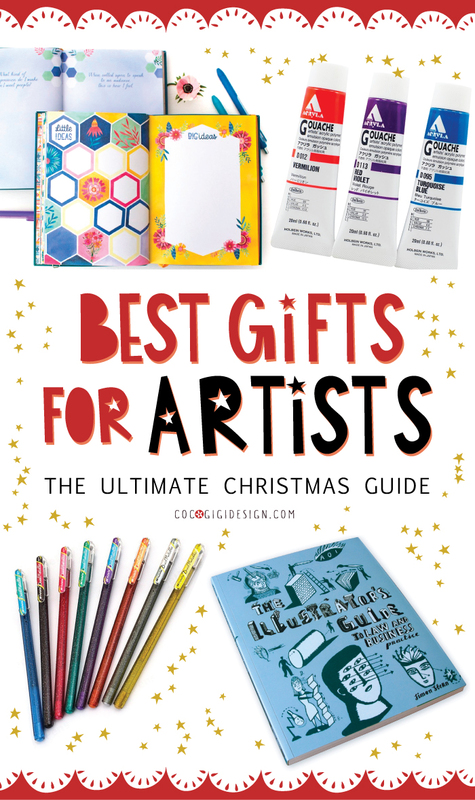 So if you’re like me and like to be organised and find your presents before the craziness of the Christmas shopping season starts, you are going to love this gift guide for artists and illustrators that I put together. On this list you’re going to find art supplies that I love, use and highly recommend (hello kuretake watercolours ♥ ), some tools to help you keep organised and some super cute finds. Also, I’m featuring a selection of products from independent artists; via the links below you can buy directly from them - you support them and get an original present to gift to your loved ones! Kuretake Irodori Kobako Watercolour Set - I’m a big fan of these watercolours, but the fact that this set comes with a waterbrush and a fine black pen wrapped in a Japanese washi paper box makes it extra special. Holbein Artists' Acryla Gouache - another favourite of mine, these gouache come in a big array of colours and are great quality. Temporary Tattoos Cats - These temp tattoos would be purrfect for cat lovers. PuniLabo Stand Up Pen Case, Gray Cat - This is the cutest pen case I’ve ever had! It transforms into a pen stand and protects well my brushes and pens when I’m on the go. Este MacLeod Designs Greenery Two A5 premium notebooks - Gifting notebooks to your artists friends is always a good idea as they’re always useful and these two are beautiful too. Sam Osbourne 2019 Wall Planner A2 Planner - Big calendars are a great idea to organise your year and decorate your walls, isn’t this calendar beautiful? Becca Cahan Guided Journal - A beautifully designed journal to write your thoughts and plans. White Pentel Hybrid Gel Grip Pen - Great to add details to your illustrations and paintings. The white doesn’t fade away and leaves a nice texture on the paper. The Illustrator's Guide to Law and Business Practice - all freelance artists and illustrators should have this book. It thoroughly explains how contracts work, copyright , business practice issues and gives you guidance on pricing your work. Cats in Garden - A4 print - a vintage inspired design featuring a sweet scene with cats on a garden. It’d look great on a nursery or studio wall. Insects Dragonfly, Cicada, Butterfly, and Luna Moth Vinyl Sticker Pack - These would be great to decorate dull surfaces. Pentel Hybrid Dual Metallic Gel Pen - 1.0 mm - 8 Color Set - you can buy the set or individual colours. I use these to write greeting cards and to decorate envelopes. The colours are very saturated and shiny and don’t fade away. Llama erasers set of 4 - Erasers are always useful but if they’re also cute and they will bring a smile to someone’s face. -STRATHMORE 400 Series Watercolor Hardbound Art Journal 300gsm (W)140mm x (L)216mm x 24 - I’ve been raving about this sketchbook all year long. The paper is thick, the texture isn’t too strong and the hard cover is awesome for travelling. La Marina Coastal Melamine Platter - I’m a big fan of Misha’s designs because they’re elegant, sophisticated and beautiful. This plate would work for organise the trinkets on your desk or to hang on the wall.